Sometimes you just know early on in a venture how things will work out. From the start, they go very much for or against you. When Summer Guerrieri started planning her online wholesale jewelry business, one of the first smart things she did was look for a URL that would be found easily by wholesale buyers searching on Google. Her associate at the time, Gerald Kent, was already running a successful offline jewelry warehouse that served local and regional retailers. Guerrieri's job was to launch the web division and find a URL that would serve the purpose. Guerrieri wanted to take the business both national and international via the Internet. She began tapping domain name services to figure out what was available out there for a reasonable price. While performing what was a thorough search, Guerrieri was not expecting to find anything available that was incredibly relevant. After all, when she was finalizing her online business plan, the calendar year was 2006, not 1996. But then, she surprisingly found CheapWholesaleJewelry.com at what she called, "A very reasonable price." Guerrieri was fairly shocked to see it available and had the street smarts to jump on the opportunity, buying the URL right away. Because of her due diligence, the wind was blowing at her back from the outset. "I looked through other domains just to see what was good for jewelry websites," Guerrieri said. "I was very, very happy to find that particular URL available. Let me tell you, the absolute first step in starting an online business is the name and URL you are going to use. If your name has nothing to do with what you are selling, your idea is probably not going to go anywhere. I mean, it might, but you have to put a lot more effort into it." As Guerrieri demonstrated, the right moniker can mean an awful lot. In the company's first two years online, its sales have grown by 20 percent month over month. Orders come into the ecommerce system and go out the warehouse door, keeping the 100,000 square foot facility buzzing with activity. These are heady achievements for a firm that, originally, was simply interested in selling rings, necklaces, bracelets and body jewelry at discount prices, online to any buyer who was interested. As it turns out, back in 2006, what Guerrieri and her team were establishing was the nation's leading source for plated 24 carat Gold, Sterling Silver, Cubic Zirconium and Rhodium chains and bracelets. And word has definitely gotten around. "We sell to a wide variety of buyers; online retailers, eBayers, flea marketers, boutique shops, etc.," explained Guerrieri, President of CheapWholesaleJewelry.com, from her office in Johnston, RI. "After only two years, we have customers all over the world. We send orders to the Netherlands, Denmark, France, Italy, the UK, Canada and Egypt, among other countries." Behind much of Guerrieri's success are the high quality products being offered and sold by her knowledgeable team. For instance, they design many of the items in-house, creating a unique product line that cannot be found anywhere else. "We pay very specific attention to the base metals that are being used, as well as the plating," she said. "We only accept the highest quality of imported jewelry. We have very particular specifications that we adhere to. A lot of the products are made from Swarovski crystals, which produce items that are extremely durable." Guerrieri said that one of her firm's key product categories was, "Jewelry Lots," which appears on the left hand navigation system at www.cheapwholesalejewelry.com. Of course, the prices vary according to what items are available in the lot. "We sell tons of our jewelry lots because they give customers an opportunity to buy a large quantity of items for a very low price," she said. "We offer an assortment of items, which is very good for people who sell on places on like eBay." Lots that would sell at a brand name big box retailer for $800 can sometimes be acquired for only $99 at the site. Every single one of the company's jewelry pieces is selected because of its appeal to the public. Some of the firm's wholesale fashion jewelry is glamorous and elegant (e.g., traditionally styled), while others are the cutting edge in today's fashion world. The second biggest category, Guerrieri said, is, "Rings." Prices vary according to the hundreds of different brands and styles they carry. However, it is worth noting that buyers who join the site's Elite Jewelry Club Membership will get 10 percent off and receive free shipping on all orders. "We have an unbelievable assortment of Cubic Zirconia (CZ) rings," Guerrieri said. "Recently, we began offering the CZ rings by style and size. Those items are great for a lot of retailers and consumers alike. They love them!" Unlike some wholesale jewelry distributors, her website does not simply focus on inexpensiveness when it comes to its offer. Quality is an equal part of why retailers and other product buyers flock to www.cheapwholesalejewelry.com. Guerrieri also offers a variety of celebrity inspired jewelry at sister site, www.summersjewels.com. There you can find the best rings, necklaces, bracelets and body jewelry that resemble the taste of Jennifer Lopez, Penelope Cruz, Rachel Ray and Jessica Alba, among others. Quality is truly "job one" when it comes to Guerrieri's merchandise. "All of our products, from our silver and gold plated jewelry to our Austrian crystal jewelry, reflect quality, durable materials that both you and your customers will be satisfied with," she explained. "When you have products that are of this top notch quality, it makes marketing them a lot easier. Word gets around." Of course, two years ago, Guerrieri correctly believed that she had unearthed an extremely relevant URL that was nothing short of a coup. To this day, she attributes a nice chunk of her company's success to that finding. But really, the URL was only the beginning of how she and her team have been able to achieve their sterling results. There has also been a bit of crafty, extremely well planned marketing involved. Guerrieri said that three of her best marketing mediums, in terms of return on investment, have been Google, CloseoutCentral.com and WholesaleCentral.com. She has also slowly but surely grown an email program that would be the envy of many wholesalers, by using a relatively simple web design tactic. "We do all of our own programming and design in-house. Having web developer, Trisha Stone, who built and maintains the site, in the next office is priceless." Stone intelligently put the "Subscribe" button and email address entry field for joining their newsletter list at the very top of the CheapWholesaleJewelry.com homepage. The capability to join the list appears in the same spot, no matter where one navigates on the site. "For the first several months, our email list was very, very small," Guerrieri said. "It has grown considerably in that time. Today, we have a little bit more than 20,000 newsletter subscribers." As any seasoned businessperson knows in the wholesale industry, while marketing is of significant importance, it is dwarfed by what is or what is not done in follow up by the sales staff. That is why Guerrieri is especially pleased to have the help of 30 year industry veteran, Joseph Cairo, who is Director of Sales. "He is unbelievable," she said. "He knows everything about jewelry, the warehouse and the website. So when a customer calls and has questions or needs to place an order, Joe can advise the customers on which items would be a good seller for them, based on where they are selling and things of that nature. He is an extremely knowledgeable resource about the jewelry business. He exemplifies the great customer service we offer." The overall truth would be shorted if Guerrieri was not singled out for setting the tone for her customer service department. While she is president of the company, she is also a hands on manager who answers the phone, returns emails and minds the website's live chat application during business hours. She began using Live Person's chat system in January and cannot say enough about the results. "We absolutely love live chat," Guerrieri explained, before joking about how hard she works everyday. "Yeah, I kind of live in front of my laptop, though. It has almost grown into my lap." The last point that Guerrieri humorously touched on, the unrelenting need for hard work, is one that is important for any team if it is going to be successful. On that front, she gives a ton of credit to her fiancé, Kent, as well as Stone, Cairo, and resident number cruncher and 15 year Wall Street executive, Jack Gaffney, as well as her other staffers. "We are successful and will continue to be, because we are truly a team of specialists, each with their own specific niche." Guerrieri said. "We are constantly analyzing everything from geographic trends to the state of the economy, from marketing ROI to gross margins, and of course maintaining our customer service and providing value at a discount to our patrons. We analyze, discuss, decide, and implement. No decision is made on a whim." One of the interesting things about this executive team's achievements is that there is not a single four year college degree among them. Old fashioned street smarts and real life know-how are driving this wholesale firm's success. Guerrieri looks to other prominent "non-degreed" role models like Bill Gates, Michael Dell and Larry Ellison for inspiration. "If they can do it, so can I," she said with confidence. The combination of street smarts and a great work ethic are what got Guerrieri the URL, "CheapWholesaleJewelry.com," in the first place. 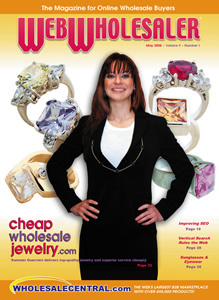 This same winning strategy, beginning with the URL and name and ending with customer service, has been implemented across their growing suite of sister sites, now including www.wholesalevintagebeads.com, www.wholesalerhinestonechain.com, www.austriancrystalchain.com, www.summersjewels.com, and going live soon, www.highendfashionjewelry.com. "We have done a lot better than we expected to, right off the bat," Guerrieri said. "It is very exciting, and I am confident we will continue to grow. We have the right team in place and the right kind of great products to keep on expanding."